Happy Wednesday! Cool news before we get started: Codebook, Axios' cybersecurity newsletter, launches Tuesday. Twice a week, Joe Uchill will bring you the latest in cybersecurity policy and defense news. It'll be a worthy read, so sign up here. Finally, on this day in 1989, Madonna released the album Like a Prayer, so we'll get going with her best song . . . Both sides of a lawsuit on damages from climate change will today in court reaffirm the scientific consensus that human activity is extremely likely to have caused global warming over the last century. Why it matters: EPA administrator Scott Pruitt has said he wants to host a public debate about the degree to which humans are driving up Earth's temperature. Wednesday’s hearing in a San Francisco federal district court, where California cities are suing big oil companies, is surprisingly providing that debate. The intrigue: The hearing will contradict doubts expressed by Pruitt and other Trump administration officials that human activity is the leading driver of climate change. Even the defendants — who include Exxon, Shell and Chevron — are expected to confirm the scientific consensus. Big picture: Wednesday's hearing, in a case brought by San Francisco and Oakland, is part of a broader legal push by liberal cities alleging that big oil companies have concealed what they knew about climate change and are liable for billions of dollars of damage. Quoted: “While conservative think tanks, political pundits, and industry-funded researchers are at liberty to say whatever they want, the courtroom demands a higher level of integrity. I expect the defendants will underscore points of uncertainty in the science, and highlight difficulties in attributing causation to particular actors. But the basics of climate science are not legitimately open to debate,” said Michael Burger, director of the Sabin Center for Climate Change Law at Columbia University. Go deeper: Amy wrote about the lawsuits here, and this San Francisco Chronicle piece sets the table for today's action. Driving the news: Today the Interior Department will announce the results of oil-and-gas companies' bids on over 77 million acres worth of lease blocs in the Gulf of Mexico. Flashback: As we noted on Monday, Interior secretary Ryan Zinke recently called the sale a "bellwether" for industry interest in the Gulf amid all the onshore shale opportunities, while a top consultancy predicted that bidding won't be especially high. Expectations game: "[O]n Tuesday, US offshore representatives downplayed the market and policy significance of the Gulf lease sale, known as Lease Sale 250, which will be held in New Orleans Wednesday," reports S&P Global Platts. Venezuela: Russian government officials and businessmen helped Venezuela launch the world's first state-issued cryptocurrency last month, which is intended to help sidestep U.S. sanctions on Venezuela, TIME reports, citing anonymous officials familiar with the matter. My Axios colleague Khorri Atkinson has more in the Axios stream. OPEC: Per Bloomberg, "OPEC and its allies held further discussions about changing the way they measure the impact of their production cuts, including proposals that would affect how quickly they hit their target, according to delegates from the group." Moving up: BP has promoted Susan Dio to be president and chair of BP America, the oil major's massive U.S. subsidiary. The chemical engineer, who has led BP Shipping for several years, will replace the retiring John Minge. One reason it matters: The move makes Dio one of the most powerful C-suite women in an industry where top-level executive roles remain largely filled by men. Read The Houston Chronicle's piece here. 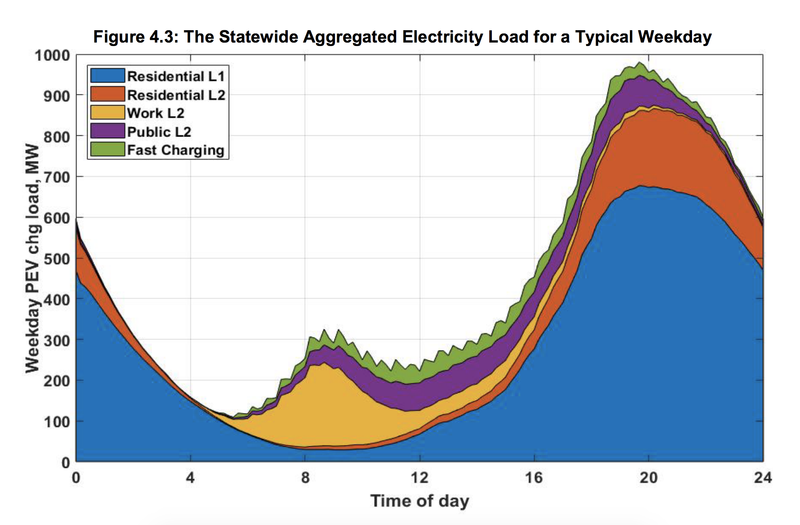 Behold the "dragon curve": The chart above, from a new California Energy Commission report, is a projection of the level and hourly-timing of increased California power demand in 2025 if the state meets its aggressive clean car deployment goals. The context: Credit to Utility Dive, which unpacks the report and introduces the term "dragon curve" to your Generate host. Dragon curve refers to the rising hourly demand when people come home from work and plug in their EVs. "[The] two peaks for the weekday load coincide with vehicles arriving at work in the morning and returning home during the evening. By 2025, workplace chargers demand more than 200 megawatts (MW) at the peak time of around 9 a.m., and residential chargers demand almost 900 MW at 8 p.m.," the commission's report states. The bottom line: The report estimates that 229,000 to 279,000 chargers will be needed at workplaces, public stations and multi-family buildings. Speaking of EVs: Per Reuters on Wednesday, "German carmaker BMW will increase research and development (R&D) spending to an all-time high of up to 7 billion euros ($8.6 billion) this year as part of efforts to bring 25 electrified models to market by 2025." Venture capital: My Axios colleague Kia Kokalitcheva reports that Khosla Ventures is raising up to $1 billion for its sixth flagship fund, and up to $400 million for another seed fund. Energy is a major part of the firm's portfolio, though we don't know yet where this new money will go. ARPA-E: One interesting part of watching Energy secretary Rick Perry's appearance before the Senate's energy committee Tuesday is that he didn't even bother defending the White House effort to kill DOE's Advanced Research Projects Agency-Energy. Why this matters: It underscores a division between the White House and Republicans —including Perry — who back a stronger federal role in supporting research, development and demonstration programs. Go deeper: Varun Sivaram unpacks this in our Expert Voices section. More VC: BP Ventures, the oil-and-gas giant's green tech venture arm, said Tuesday that it's investing $500,ooo in the Incubatenergy Network, a consortium of clean energy incubators in several cities. BP said it's also forming a "strategic relationship" that will involve "technology scouting" with eight of the members, and twice-yearly meetings with the wider network. Cars: A piece in the Axios stream explores how auto companies are responding to the death of an Arizona pedestrian struck by an Uber self-driving car. Some —including Toyota and the startup nuTonomy — are pausing testing programs, while others including GM, which plans to field self-driving EVs next year, are pressing ahead. Worth your time: Yesterday the Atlantic Council hosted a rather feisty discussion between solar pioneer Jigar Shah of Generate Capital and Sivaram, who wrote the Expert Voices mentioned above and also is author of the new book "Taming the Sun: Innovations to Harness Solar Energy and Power the Planet." On the one side: Sivaram's book argues that absent major innovations in tech, policy and more, solar's current boom will hit a ceiling that's far below its potential to fight climate change and provide affordable energy worldwide. On the other side: Shah pushed back against Sivaram's thesis, even accusing him of promoting an "insidious" message. The big question: It highlights a big tension among camps of low-carbon advocates — whether major tech innovations are necessary in the fight against global warming, and whether emphasizing the need for breakthroughs saps focus on deploying existing technology. Several outlets reported last night on new EPA disclosures to Congress about the price tag for Pruitt's travel habits. "The records, which came at the request of House Oversight and Government Reform Committee Chairman Trey Gowdy (R-S.C.)...show dozens of first-class domestic and overseas flights for Pruitt and other trip expenses between August and last month." The figure includes stays at expensive hotels in New York and Paris.